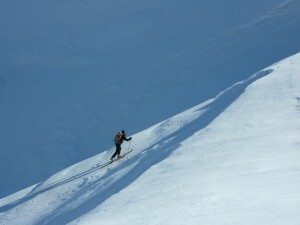 A classic route along the Haute Route Pyrenenne (HRP) and justifiably one of our most popular ski tours. Stunning mountains, no tracks, good huts and great skiing with lots of opportunity to peak bag along the way. 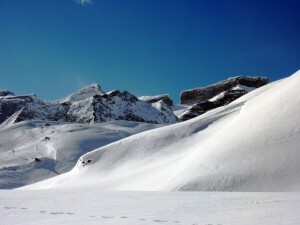 You ski for six days through remote valleys and climb to the highest peak in the French Pyrenees, the Vignemale (3289m), as well as the mythical Mont Perdu – hidden behind the dramatic Cirque of Gavarnie and accessed through the natural rock doorway on the Spanish border known as the Breche de Roland. You weave your way West to East, criss-crossing the French – Spanish border at several key points: the Col de la Fache, the Port du Marcadau, the Col des Mulets as well as the Breche de Roland. Many of these crossings have been used as trade routes for centuries but more recently were used as escape routes over the Pyrenees in the Spanish Civil War and World War Two. Price: 1395€pp includes seven nights accommodation, all dinners, breakfasts and picnic lunches. Meeting Point: Lourdes (flights to Lourdes or Toulouse + train). Extras: Lift passes, hire gear, transfers Lourdes-Luz (15€ shuttle from airport or 8.60€ bus from train station). Day One: We collect you from Lourdes airport or Lourdes SNCF train station and transfer you to our valley base of Luz St Sauveur. We spend the evening checking equipment and picking up hire gear if necessary. Day Two: The first day’s touring takes us to the Respumoso refuge in Spain via the Col de la Pierre St Martin, just east of the famous Balaitous mountain. The Balaitous was first climbed by the military surveyors Peytier and Hossard. However they did not disclose their ascent and the route to the summit remained a secret for 37 years. In fact it was not even known that the mountain had been climbed until the Pyrenean explorer and historian Charles Packe set out on his second attempt to find a route in 1864. When he finally found a way to reach the summit he found that a cairn had been placed there. Day Three: We cross eastwards to the Wallon Refuge (Marcadau Valley) through the Col de la Fache. It was through this pass that many allied pilots escaped Nazi forces during the Second World War, but it was also the pass through which Republican forces fled from Franco in the Spanish Civil War. Just after the pass is our first opportunity to ski a peak – the Pene d’Aragon, before skiing the 1200 metres or so down to Refuge Wallon. Day Four: From Refuge Wallon we make tracks up through the Arratille Valley to reach the Col d’Arratille and the Spanish border. We cross here, ski down for a few hundred metres and then climb back to France at the Col des Mulets. Then there is a great ski down to the Oulettes Refuge below the daunting north face of the Vignemale… the objective of the next day. 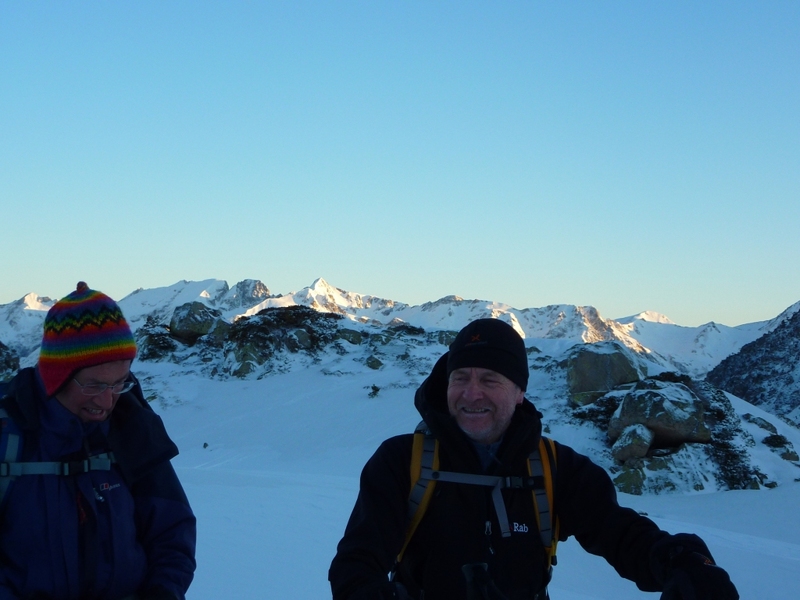 Day Five: You leave the Oulettes Refuge early and climb first to the Horquette d’Ossoue before making a short descent down to the Baysallance Refuge. From there you cross past Henry Russell’s caves before climbing up the long glacier and reaching the summit of the Vignemale at 3298m. From the summit we ski back down the glacier before heading east through canyons and gorges following the snow out to the Barages d’Ossoue. A long gentle ski brings us out to the road head where we meet our transport to Gavarnie and a comfortable bed. Day Six: We set off heading back to Spain via the Breche de Roland, a huge natural doorway through cliffs on the border and the subject of much French folklore and legend. After the Breche we ski down to the Goriz Refuge early in the afternoon. Day Seven: Today is the longest and most challenging on the tour. 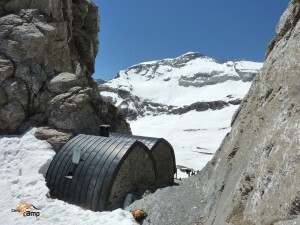 You leave the hut early and head up steep slopes to the Lago Helado and the Col du Cylindro. A fit group can climb to the summit of the Mont Perdu from here on crampons 400 metres above the pass. Most groups though decide instead to cross to the north face of the mountain to get the most out of the ski descent. A great ski is interrupted by a small abseil over steep slopes on a cliff face. You then carry on skiing to the bottom of the Breche de Tuquerouye, another extremely impressive 'breach' in the mountain. You then climb again, but this time on foot for just 150 metres before putting your skis back on to ski down a steep (40 degrees) slope into France and the Cirque of Estaube. This can be a great ski in good conditions. From Estaubé we put the skins back on and climb 400 metres to the Hourquette d'Alans before the final 1200 metres ski on north west facing slopes back to the village of Gavarnie and our transport back to Luz St. Sauveur. Day Eight: You are transferred back to Lourdes Airport or Lourdes SNCF to connect with flights home. To book you can use the on-line booking system below - select the start date and the end date and then proceed. The system will ask for a deposit which you pay using PayPal. Or, if you prefer, you can email us directly (sian@pyrenees-mountains.com), ring directly on +33 5 62 92 81 52, or Skype at sian.grigg.